or suppose a scenario in Wingmakers story represents some right actions and attitude. But perhaps these are not the whole intention of encoded sensory date stream technology . So we can suppose when we looking at wm story or glyphs,they can feed back our DNA molecules in a unconscious level,redefine programs of HMS in human instrument. These sensory date stream is absorbed through our eyes,affecting our DNA, accelerating new circuits in our body beyond our perception. Wingmakers story,through sensory date stream that we unfamiliar with,once we are reading,the unconscious transformations are done through a encoded scenario.Because of “What happens to one happens to all”,when we enjoy wm arts,all humanity enjoy the arts through unconsciousness,and our collective HMS have been transferred. Such as the painting above,you look it,think about it’s meaning or try to understand it,these are conscious process,in this process,perhaps our DNA is being changed or higher circuits are formed in our body. Yes,we are not aware of these transformations consciously,but Wingmakers recommend us to use imagination,we can imagine these changes is happening when enjoy wm arts,and this also apply to wm poem,video and interview. What happens to one happens to all，when we marinate with wm arts,through unconsciousness, sensory date stream are sent through wm enthusiasts to all humanity beyond our perception. Last edited by yhg342 on Thu Mar 24, 2016 9:20 pm, edited 1 time in total. I am intrigued… what original painting does the bottom image come from? I recognise the digital mash up that has the red infinity symbol, but you have more of the image than shown in that picture. Yes there is something unusual about the art – it interacts with us at the unconscious level, with particular facets connecting with our life at the normal conscious level. Perhaps it hints to us secret or unknown pathways in and out of this matrix. And I agree that language can be so much more than just a few shapes we call “letters”! The Art, music, poetry etc including philosophy, all of the WMM are embedded and maybe in a multidimensional way and perhaps that is the "app" James refers to in the 5th Neruda Interview that rides the HMS without being a part of it or even changing it but activating awareness of the Sovereign Integral and effecting all 3 mind components, the subconscious, unconscious and conscious mind. How could we not be changed after that? The painting found on the First Source CD John Berges' called them Master paintings. I have checked my Portal paintings and can't find the painting you have used in your posting. And here is something from the Living From The Heart paper by James where he emphasizes living the 6 Heart Virtues. Everything of the WMM has culminated to this one practice utilized as a way of life. This is not a passive thing. We are consciously aware and proactive when doing it. All the Art, music, philosophy, interviews, novels, everything leads to practicing the 6 Heart Virtues as a means of co-creating with the Designing Force the transformation of humanity on this planet like never done before. It's not a matter of exiting this so-called matrix it is about transforming it beyond recognition from its original purpose of oppression and enslavement. We can do this as a CHEF. Practicing those virtues is what opens up our DNA in receivership of the energetics coming to this planet from the Central Sun to transform humanity. I highly recommend you reading that paper yhg342. of the shift, you are an activating force of the shift. It all starts energetically. The shift is a co-creation between the Designing Force and the human family. It is both elements operating in a dance of resonance. The shift is not a thing that happens to humanity; it is a thing that is co-created by humanity and the Designing Force. I cannot find it in my installed Wingmakers folder on my computer either. However I'm not sure if my CD has ever worked properly, as after doing a normal installation and then leaving the CD in the drive, later on it would try to install something else that I had not instigated, and it always stopped with an error at the same place. (Though the normal installation always worked). I was intrigued what was happening - if this was part of the later activation of the CD that James said may happen. I was never able to get to the bottom of it. Now my CD is in storage a long way from where I live, so I do not have access to it. For some reason though... I remember that very particular series of circles was recorded in my memory. I recall examining it many years ago. The painting you have must come from another part of the CD. So I'm still intrigued. The only CD that had any paintings on it was the First Source Disc. The First Source Disc has not been updated and if you have updated your browser over the years it may not open any of the files on that Disc. I just tried it, it works on Mozilla Firefox browser. Looking at the paintings. PDF file of Vision of Mantustia. Yes, the source of this image is unknown. sirryah did call it a mashup, which means it was recreated and made to appear that way. Unless secret codes were found giving access to coded material on the First Source disc if I understand that correctly. 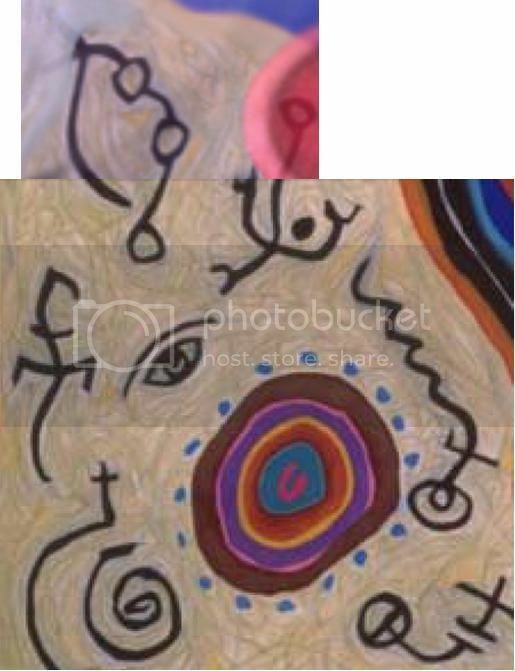 Does yhg342 not understand what we are asking here about the source of that picture? Hi，sha，I have said this picture comes from AA CD Vol 1, install the software in the CD,then you will find it,not a single file,shima has given an answer about where this picture comes from,but you need to install the software first,then find it in a pdf in it. Obviously I have already installed the First Source disk, yhg342 I already stated that earlier when telling Darlene It opens in the Mozilla Firefox browser. i don't have IE and that could be a problem for me in using this disk I don't know. I found that a file called Vision of Mantustia under a pic from a secret passage clicked on from a pic under the Philosophy Heading but when I clicked on Vision of Mantustia nothing happened. Why is it so difficult to tell someone exactly where you found that file? I've had this disc for years and its been sometime since I last played with it like this but it is coming back to me now. It's not like other people won't remember how it works either. It would be a courtesy to help save us some time in finding that file and especially if some have browsers not as responsive as they could or should be. I don't know if my browser is being unresponsive or if I even have the right file. I hope your understanding,I really do not remember exact place of this picture when I posted,but I am sure it comes from AA CD Vol 1. I have this picture for several years. If your browser is not suitable for this,you may enter the fold where you installed software ,then you can see the hidden files with ease. then click the "ebook " fold,then click the "secret" fold,open the "pdf" fold,there is a "Mantustia.pdf",you will find the picture in this pdf. upper parts of the picture also can be found in this software,but I do not remember exact place. I give my gratitude to our universe to remind me something missing in my post. Thanks to Sha and Universe both. Some browsers do not support this wm software well. about 10 hidden paintings are found with music,if you find hidden paintings without hearing music,please change your browser to try again or open your speaker first. Please don't call me Sha. It's Shayalana. I am experimenting with different browsers and music players. VLC media player works great in Firefox probably because its open source and compatible with many different OSs. When I first got this disk over a decade ago it was more compatible with IE and the Realtime player and then over time the Realtime player had problems. I have changed operating systems over the years and also experiment with different Linux OSs as well. But this disk is specific for Windows (earlier versions especially) and Mac. Anyway I am experimenting like I usually do in situations like this. There are 2 pics that have the Vision of Mantustia links that I have found so far. I'll get to work eventually.